The Melo Effect: Where Did All The Knicks Fans Come From? 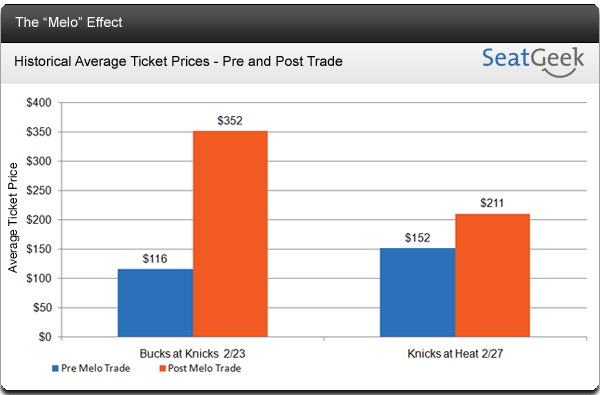 Carmelo Anthony has been a Knick for only a few days now but in those few days he has had a significant impact, The Melo Effect, on Knicks ticket prices for games both at home and on the road. Immediately after the trade news broke, Knicks tickets soared in price for a game that would otherwise be a run of the mill mediocre NBA game. Melo’s debut against the Bucks turned this otherwise average game into the highest rated regular season Knicks game on MSG in 16 years, just shy of beating out Jordan’s return to the Garden (where he scored 55 points) after coming back from retirement. It almost seems as if the Knicks fan-base has doubled in the past few days. The Knicks are coming off a few layup victories against the Nets and Bucks but we will finally get to see how their new team matches up against an Eastern Conference powerhouse when they head down to Miami this Sunday. The Knicks recently beat up on Miami at Madison Square Garden, this weekend we will find out if they can replicate their previous success against the Heat with the addition of Carmelo Anthony and Chauncy Billups.